Pest Off! Rat Control Line Review + Give-away! I love pets, dogs, rabbits and hamsters. I consider myself a pet lover, but I don't like pests. Haha. Rat and Mice are one of the common household pests. New or old, your home is not exempted from these little critters. Now, you probably have a rat or mice problem and you don;t really want to take the route the granny took in the movie Ratatouille. Shotguns will NOT solve the problem. 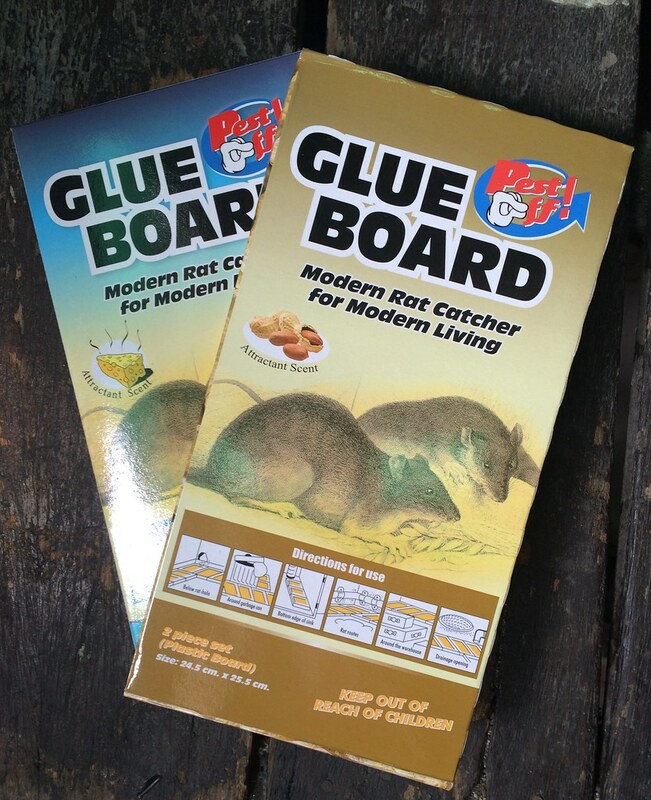 Let's take the safer way and use a non-toxic and convenient way to help control your rat and mice issue. Pest Off! has numerous products in the rat control line to help you with your rodent control needs. 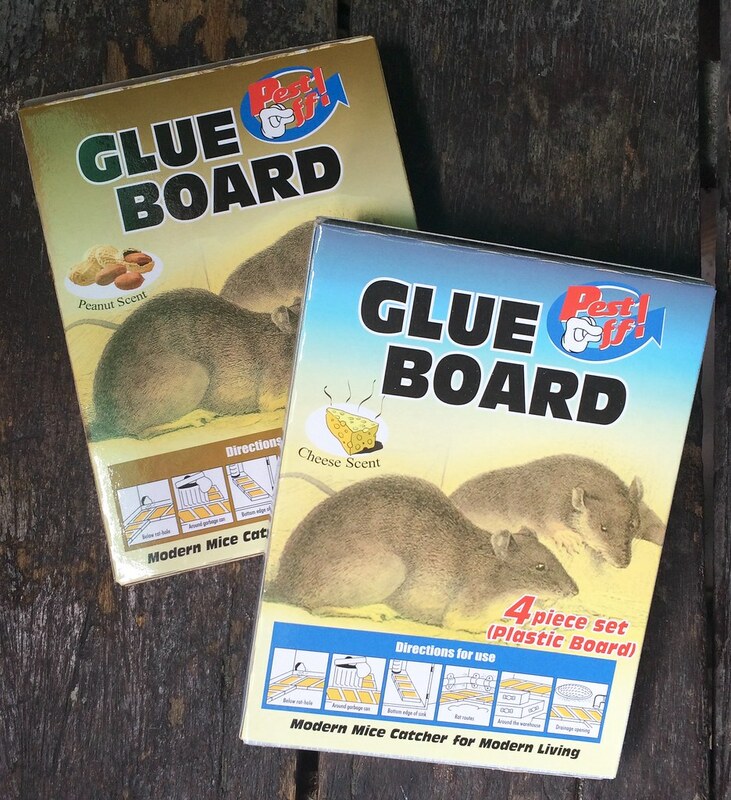 Regular Scent Cardboard Glue Board (Php142.75) and the Word Board Glue Board (Php148.75) in 2 pieces per set. 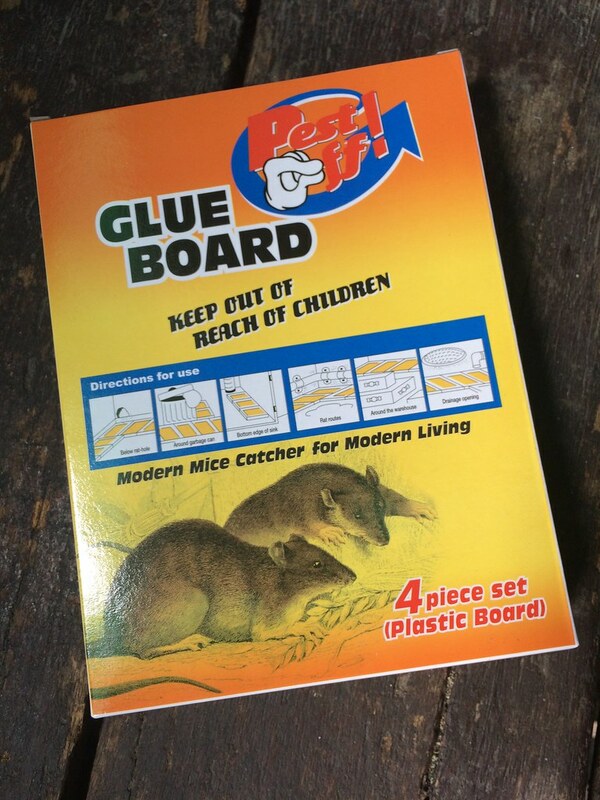 Mice Catcher Plastic Glue Board in Cheese and Peanut scent (Php96.25) in 4 pieces set. Regular Scent Mice Catcher Plastic Board (Php90.25) in 4 pieces set. Pest Off! 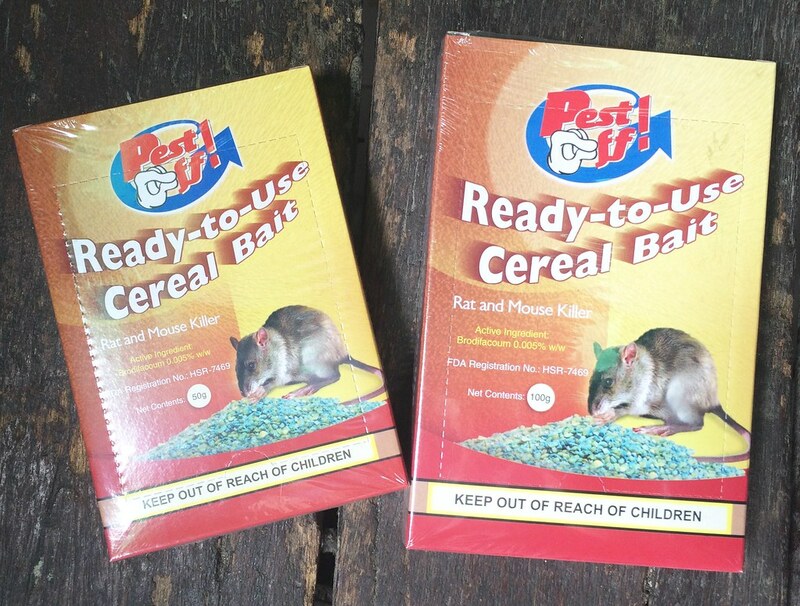 Also offers a Ready-to-use Cereal Bait which contains 2nd generation anticoagulant (prevents blood clotting which leads to internal haemorrhaging which leads to the death of the rodent) compound: Brodifacoum, which makes a SINGLE feed to effectively eliminate rat and mice. Here's a review from my personal rat catcher: my hubhub! Affordable VS. Other Brands. The main reason why he chooses Pest Off! becuase compared to others this is the most affordable on the market. Glue Effectiveness. 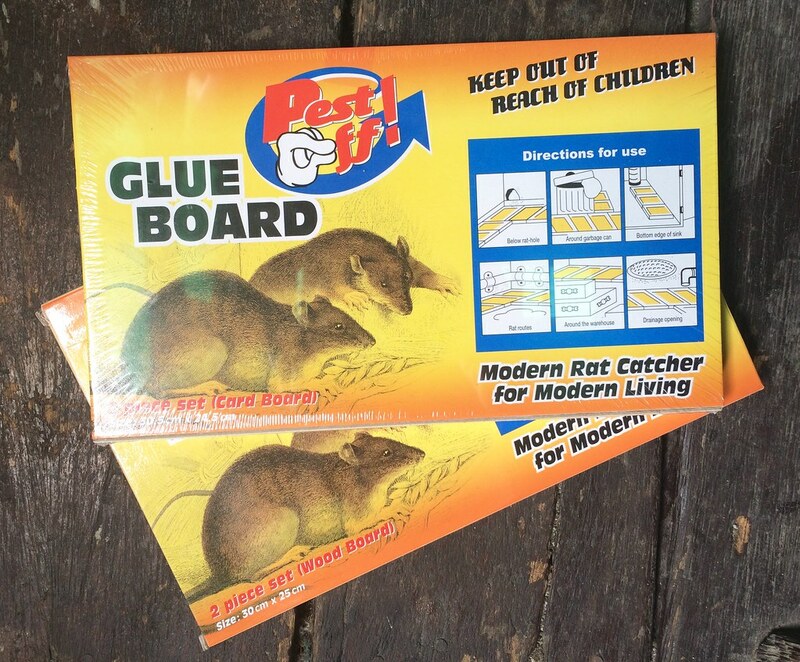 If you place your glue boards right, mice and rats will surely stick! Variety of sizes. Bigger boards for larger rats and also they fit into the right places of your homes. Big or small corners Pest Off! has you covered. Hygienic. My husband finds them easy to throw away with wrapping them in newspaper and a trash bag. No mess! I was happy that we were asked to review Pest Off! since we have been using this brand for years! The affordability of this product really makes it the first choice. Why stress on rodents when you can eliminate them effectively, safely and hygienically. Don't Move around the furniture to make room for the glue boards. Mice and Rats are very smart. If you change the furniture around they will avoid that area and know something is different. Place them in the corners of the room - Since Mice or Rats use their whiskers to guide themselves they like the corners more. Place Glue Boards next to each other. If you don't catch them with the first board (some are pretty smart and quick), the next will surely slow them down. Now that you have read about effective it is, how about trying the Pest Off! Rat Control Line for yourself for free? Pest Off! has been generous enough to give Php1,000 worth of products each for 2 (two) of my lucky followers! Yes 2 winners! "I want to win a Pest Off! 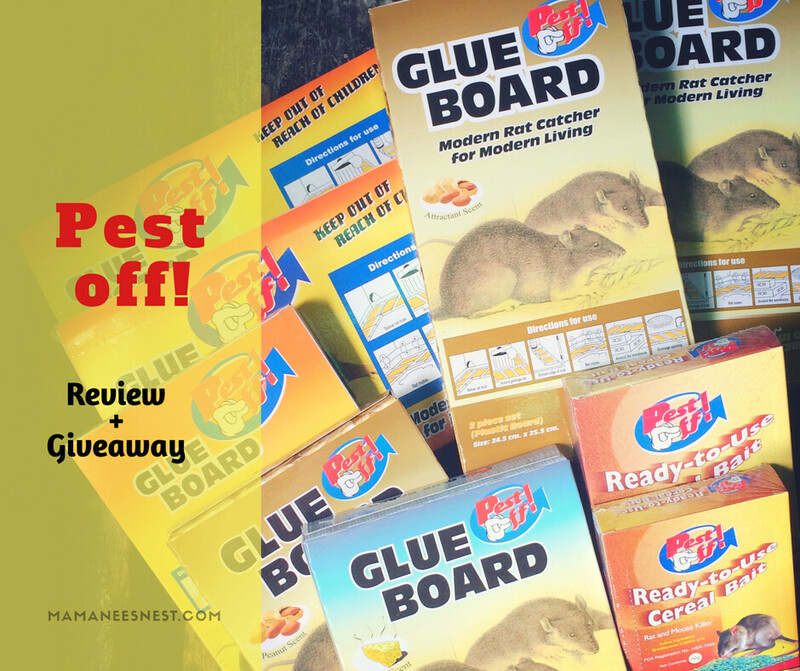 (tag @pestoffphilippines) mice and rat control products from Mamanee's Nest (tag @MamaneesNest) because ______________ (state your reson). Join the giveaway, too, (tag 2 or more friends)! Check the details here: http://goo.gl/GmwbLy #PestOffPH #PestOffxMamaneesNest"
Make sure to make your post PUBLIC so I can verify. 1. Giveaway is open to Philippine residents with a courier accessible and deliverable address only. 2. All Entries will be checked and any entry deemed flasified will be disqualified. 3. Winners can only win ONCE even if joining other Blogs. Winners are deemed final after checking. 4. Winners will be notified via FB Messenger and are required to acknowledge and reply within 48 hours or prize will be raffled off to another winner. 4. Prizes will be shipped and a Tracking number will be provided to the winner. Pest Off! and Mamanee's Nest will not be held liable or responsible for loss or damage once shipped. 5. All you need to is enter via the rafflecopter below and winners will be announced here on the blog and on Mamanee's Nest Facebook page. 6. Give-away will run from August 7 to August 21, 2016. Good luck lads and lasses!! I saw some sewer rats a few days ago and someone told me that some sewer rats likes to come out in the toilet bowl during rainy season..so afraid.Mice its like a household pets that always sneeky and smart. Good luck lass! :) Thank you for joining. Nice tips! Very useful. Thanks for sharing! We use Pest Off! to control mice and rats on our "mini poultry" at home. Aside for its affordable price, the products are easy to use. Gusto ko itong Pest Off dahil madali lang gamitin para makontrol ang mga peste na nagdadala ng mga sakit sa aming bahay. Panigurado madadali silang matatrap dito at di kagaya ng ibang brand na maaring makalason sa amin at lalo na sa anak ko na kahit anong makita sa bahay ay isinusubo. At higit sa lahat hindi makalat. My choice is Pest Off because I've been reading a lot of reviews about it. And I think it's affordable but still has the quality of a great to finally get rid all those mice and rats. It's my choice because it's very effective, the price it worth it and most of all. it's convenient to use. It a very good choice because its very effective and it worth the price.